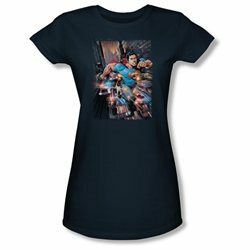 Wicked Tees officially licensed new girls SUPERMAN ACTION COMICS #1 t-shirt tee. This novelty tee is color NAVY. Standout from the crowd in this 100% officially licensed SUPERMAN shirt. This premium Round Neck tee is made in the US and printed on demand so that your SUPERMAN ACTION COMICS #1 Sheer t-shirt color NAVY is guaranteed to fit right and look right every time you put it on. We are an officially licensed company in the USA and aboard to sell this SUPERMAN ACTION COMICS #1 design. Wicked Tees officially licensed new girls SUPERMAN ACTION COMICS #1 t-shirt tee. This novelty tee is color NAVY. Standout from the crowd in this 100% officially licensed SUPERMAN shirt. This premium Round Neck tee is made in the US and printed on demand so that your SUPERMAN ACTION COMICS #1 Sheer t-shirt color NAVY is guaranteed to fit right and look right every time you put it on. We are an officially licensed company in the USA and aboard to sell this SUPERMAN ACTION COMICS #1 design. When you buy a shirt through us, you're getting an authentic, officially licensed girls SUPERMANSheer Round Neck shirt is guaranteed to look and fit great.This Shirt will be delivered in youth sizes. S = 8, M = 9/10, L = 11/12) About Wicked Tees - Wicked Tees is a leading internet t-shirt tee retailer with hundreds of thousands of licensed t-shirt tees for you. We have thousands of T-shirt tees for popular TV shows, movies, superheros super hero, pop culture and classic brands apparel. We offer hundreds of styles of shirts including tank tops, v-necks, slim fit, baby onesies one piece, ringer shirt ringers, heathered heather shirts, long sleeve shirts, womens t-shirts, mens tees and new sublimation tshirts. We start by sourcing the best feeling, best fitting, highest quality t-shirts for our stock. From there we use either our cutting edge print-on-demand technology or classic offset silk screen printing to bring you the freshest styles and coolest designs for all ages.